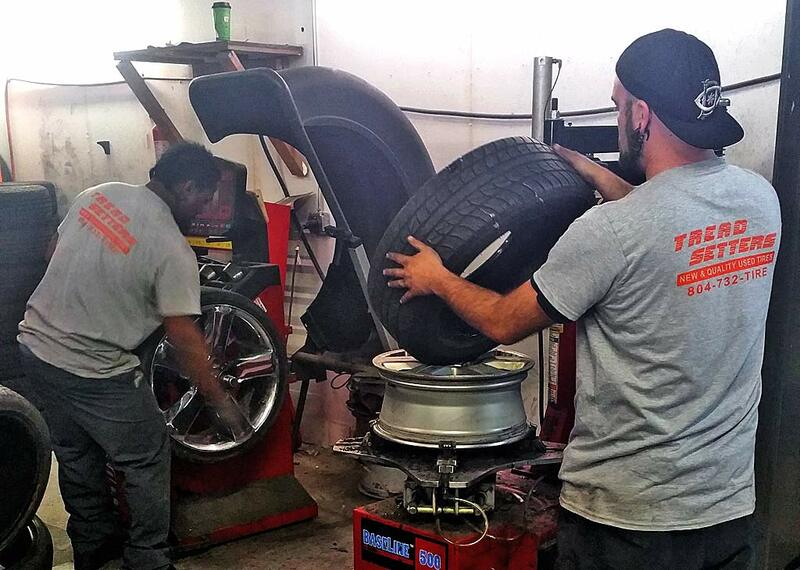 When it comes to tire repairs, we do them the correct way. For your safety Tread Setters will only repair your tire in accordance with RMA Procedures (rubber manufacturers association). A correct tire repair seals the inner liner of the tire which is designed to hold the air, and fill the injected damaged area on the outside of the tire. At Tread Setters we offer a combination of patch and plug this function repairs the damaged tire on the outside and the inside also known as a mushroom repair. The tire patch that is used in this process restores air containment in the inside of the tire. The tire plugged is used to fill the damaged tire on the outside to prevent the patch in the inside from getting wet and damaged from external factors. If your tire has been damaged, the inner liner of the tire must be cleaned, buffed patched, and coated to make sure the tires ability to retain air has been restored. This process can only be done on the inside of the tire, this is why a simple plug is only good for a temporary fix and is considered improper. Tread Setters will properly repair your tire even if the tire was not purchased from us. Balancing your wheels is a cost effective way to promote safety, reduce tire wear and increase fuel efficiency. Unbalanced tires can lead to uneven wear, vibration, and potentially unsafe driving conditions. Day-to-day tire treadwear causes changes in the distribution of weight around the tire and wheel assembly. Balancing your wheels minimizes potential vibration felt in the steering wheel, seat, or floorboard and aids in proper tire treadwear. Getting your wheels balanced can result in a smoother ride and reduced tire wear. If you have any questions about tire balancing, please contact us. Mounting is the process of installing the tire onto the rim. Tread Setters has the capability and equipment to mount rim and tires from sizes 13’s to 26 inches. During this installation process, Tread Setters also does a service called Bead Sealing. This process ensures that no air escapes from between the rim and tire to prevent minor leaks from around the edges of the rim. 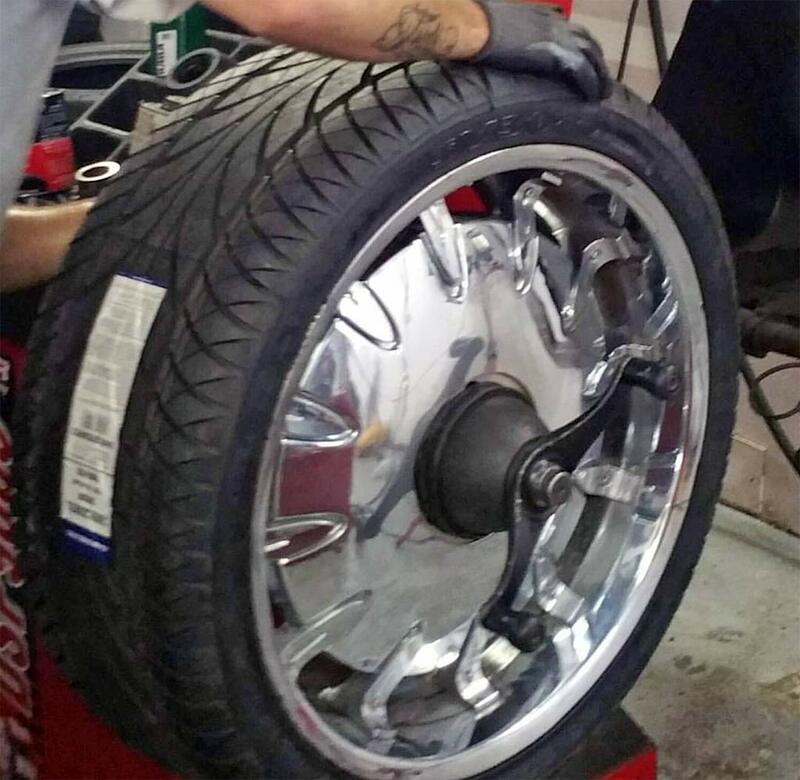 This process is done on rims and tires of all different sizes. Flat tires are an unfortunate fact of life. Whether it is a slow leak, a leaky valve stem or a tire puncture, Tread Setters has what you need to get safely on the road again. If you are driving on a tire that continuously loses air or has a puncture, it is very important to your safety to have it inspected immediately. A service professional should inspect the tire inside and out to determine whether it can be repaired or needs to be replaced. Here at Tread Setters we believe in properly recycling your used tires. Tire recycling is the process of reusing old tires to make new products such as rubber mulch, race tracks, playgrounds and etc. Recycling scrap tires is very important and reduces how much energy sources we use on a daily basis. Tread Setters works in partnership with major tire recycling plants to properly recycle your old damaged used tires with no cost to our retail customers. Tread Setters is doing its part to help the environment. 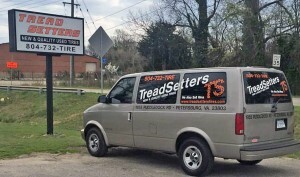 Tread Setters is licensed and insured in the state of Virginia to haul and properly dispose of waste tires. Unlike our competitors, we offer an outstanding program for the Original Generator. Tread Setters is logistically managed to curbside pickup tires on a weekly or bi weekly schedule. Pick ups occur based on generator requests and volume generated. We currently offer this service in the Northern Virginia, Richmond, Tri-Cities and Hampton Roads area. Please contact us for Validation and more information on this service. TPMS is the tire-pressure monitoring system, designed to monitor the air pressure inside your tires on newer cars and trucks. A working TPMS triggers a warning light on your dashboard letting you know that the air pressure for your ties needs attention. The target of a TPMS is avoiding traffic accidents, poor fuel economy, and increased tire wear due to under-inflated tires through early recognition of a hazardous state of the tires. 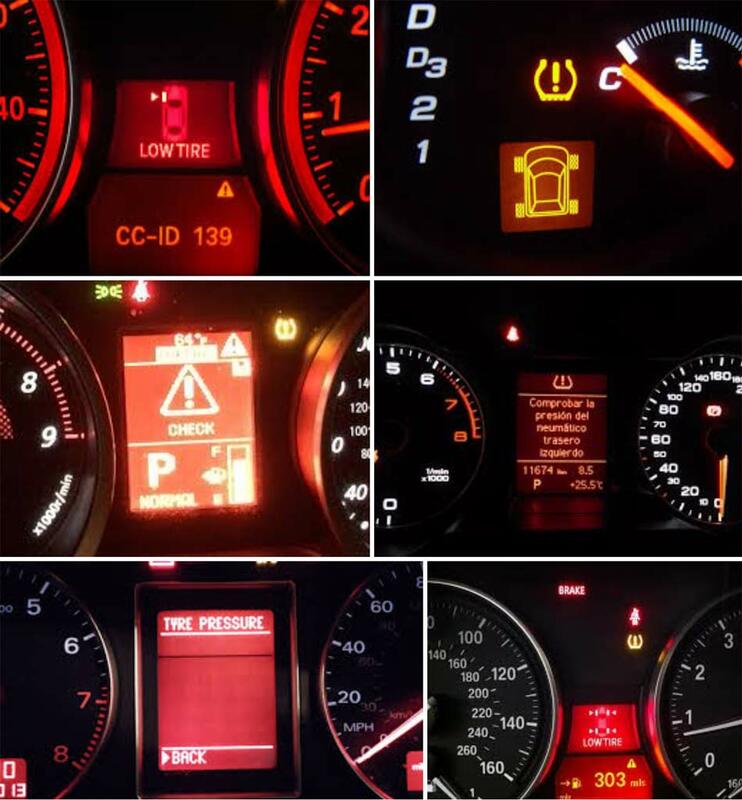 We have the tools and computer application to replace defective TPMS sensors. If you have any questions about your TPMS sensors, please contact us, we will answer them.